Welcome to TCM''s special release blog hop! 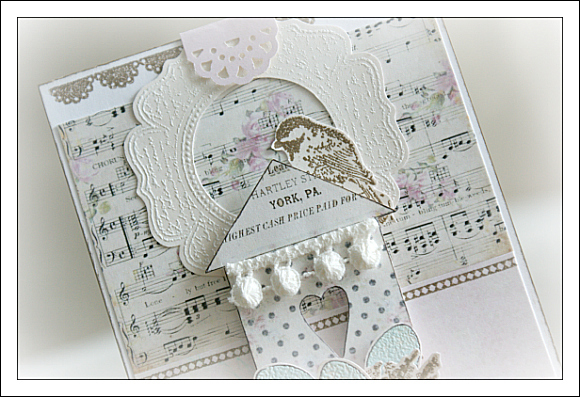 Today is all about a beautiful, special stamp release by the lovely Nina B! It is a truly wonderful set- just in time for Easter! I hope you are joining us for the blog hop we have planned! If you are arriving from Amy's blog, then you are in the right place. Otherwise, you can head back to the TCM blog and start the hop from the beginning! If you have accidentally stumbled upon my blog and need something to entice your mind to hop with us - hopefully the prospect of winning some stamps is just what you need to hear to join us on this fantastic hoppy adventure! 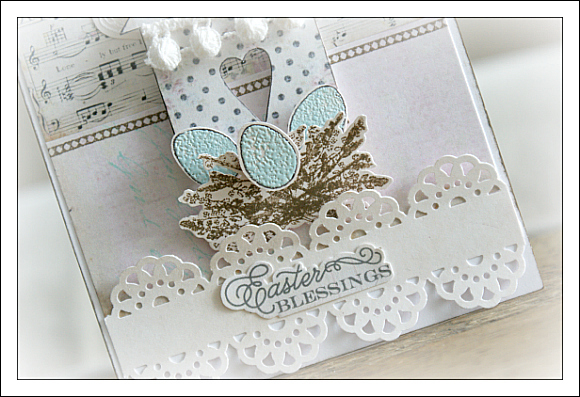 Here is a card I've created with one of the lovely sentiments in this beautiful new set by Nina, along with some of my other favorite Easter stamps. I have to admit, I started working on this card a bit late, and was only able to incorporate the beautiful Easter sentiment from the 'No Greater Love' stamp set by Nina B. It is really a wonderful font and just the perfect size for Easter cards like this one. This set also features other lovely images and sentiments, simply perfect for Easter crafting. Along with the TCM stamps, I've used some of my favorite My Mind's Eye stamps (for the cute little bird) as well as precious little robin's eggs from this Prima stamp set. The paper on the card is from Beatriz Jenning's lovely shop over at Etsy. If you love shabby designs, her store is one you do not want to miss! I love browsing through her lovely products. Sometimes it is enough to inspire me and at other times I simply cannot resist picking up a few new designs to try out. 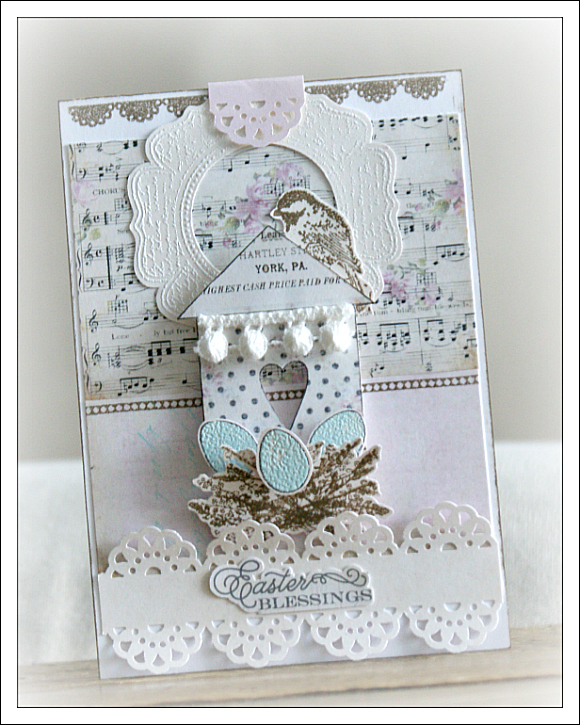 For the background of the card and for the little house, I used this beautiful collage from Bety's shop. I created the little house by cutting a rectangle out of the two different patterns on the collage. Then I cut off a tiny strip from either side of the house (without cutting the roof) to create the indents. I cut the upper part of the paper to create the roof, and then used this die-cut to create the little heart inside the house. I added in some cream and white cardstock and a touch of Tiffany blue with some embossing powder for the robin's eggs. I used the EK Success Abstract Flower border punch for the bottom of the card and a touch of Distress Ink around the edges of the card. I hope you enjoy the wonderful hop and all the beautiful artwork along the way. Before you go, leave a comment here for your chance to win some stamps!!! By leaving a comment on all the blogs you visit, you can increase your chances of winning! As always your work is gorgeous. Love these card,I just love how delicate and intricate your work always is. wonderful card! I love the embossing o the robin's eggs. This is so pretty! Love the finish on the eggs and the gorgeous trim! This is beautiful. You are so talented. Oh my - this is stunning! I love everything about it. so, so, pretty. Love the little robin's eggs and the music paper background. Lovely touches. Beautiful Easter card--love the blue eggs. Such a beautiful card! I love the sentiment and those colors are so soft and pretty together! That is just beautiful! I love the embossed eggs. The color is perfect, too. The embossing, and the pom poms----AMAZINGLY wonderful! Every now and then I come upon a perfect card. This is one of them. This is so sweet and pretty! I love the robin's eggs and house. Oh wow. Just gorgeous---everything about it is gorgeous. Ivana, your cards are such works of beauty!!! LOVE!!! Super fab card. I'm gong to buy that EK border punch soon, it's so dainty. Happy Birthday to The Craft's Meow. More Power to you! Pretty card - would have liked to see more of the stamp set. Stunning - love the dimension you have incorporated in this beautiful card. Beautiful card. Love the delicate coloring. How lovely! you girls are making miracles with this stamp set! Beautiful! I love all the elements! So delicate and beautiful. Great job! Beautiful card Ivana!! I love the little blue eggs!! So stunning! The colors on this Easter card are top notch!